My job is to make and bake homemade bread for Will. Will's job is to slice and eat the bread I make! This week while Will was away on a business trip in Boca Raton, Florida, I found myself not just baking bread, but actually eating it! I made egg salad (with fresh eggs from our "girls" for egg salad sandwiches, topped with fresh romaine lettuce from my neighbor Jerry's garden, and my homemade bread). I ate a delicious roast beef sandwich (with Jerry's romaine lettuce and my Julie's Daily Bread), and I thoroughly enjoyed a bacon, lettuce (Jerry's again) tomato and cheese sandwich on toasted homemade bread! During St. Patrick's Day I am on the lookout for lean corned beef to stock my freezer with, because it's on sale. That gets me thinking about rye bread and how great it tastes with thin sliced corned beef on it! Rye bread is always so expensive at the store, but it's not difficult to make, it just takes a bit of rye flour and caraway seeds. Today I made a huge free-form loaf of Potato Rye Bread to go with our supper and for sandwiches later on. 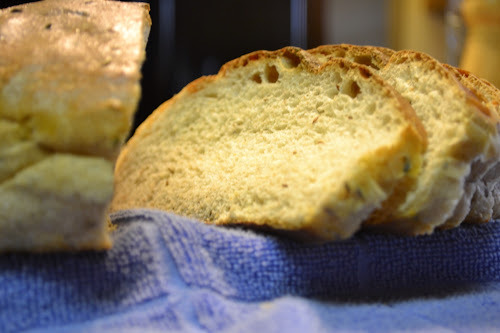 This bread is so soft and light because of the potatoes and has great flavor! 1 egg + 1 teaspoon of water whisked together; for brushing on risen loaf before placing in the oven. Add all the ingredients in the order suggested in your bread machine manual. Leave a dry well in the center of flour to add your yeast. Gently press down dough when cycle is finished. On a lightly floured surface, form dough into an oval loaf, and place on a parchment lined or greased baking sheet. Cover loaf with greased plastic wrap or a tea towel and put in a warm, draft free place to rise, about a hour. Gently brush risen loaf with egg wash.
Bake for 25 minutes; cool completely on wire rack before slicing. Tip: Keep your rye flour and caraway seeds in the freezer. Flour and seeds will keep almost indefinitely if frozen. I also keep a supply of frozen mashed potatoes in the freezer. Potato Rye Bread ~ this isn't just any rye bread, this is rye with the texture of soft potato bread! The bread was so wide, you can make a sandwich with 1 slice! 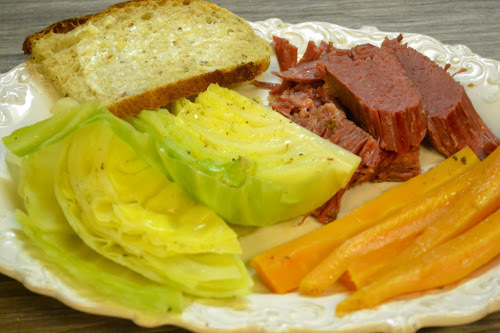 Corned beef, carrots are from our garden, cabbage and Potato Rye Bread . . . Yes, it was delicious! Rye Bread . . . How do I love thee, let me count the ways . . . buttered, with crunchy peanut butter . . . toasted with butter and raw honey . . . grilled cheese on rye . . . Reuben sandwiches . . . Corned beef on rye . . . hamburger with Swiss cheese and grilled onions on toasted rye . . . and with my corned beef and cabbage! It's great to have Will back home, even if I have to share my Potato Rye Bread . . . Over at Julie's!! !